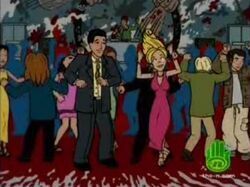 "Daria Dance Party" was the fourth episode of the third season of the Daria TV series (episode number 304). It first aired on MTV on March 17, 1999. "Daria Dance Party" was written by Peggy Nicoll. When Mr. O'Neill asks for volunteers to help with the upcoming school dance, Quinn volunteers to head the dance committee -- after a volunteer-phobic Sandi, remember a horrible time she had running a dance at junior high, eggs her on in the hope she'll suffer -- with the Fashion Club as her advisors. However, Quinn gets stuck with doing the job by herself when she and Sandi disagree on the decorations and the Fashion Club bails out. Not content with that, Sandi "accidentally" schedules a party at her house the same night as the dance. Meanwhile, Brittany and Kevin have split up for good (for the time being, at least), and to show their loyalty to their respective leaders, no member of the cheerleading squad will accompany Kevin to the dance, and no member of the football team will accompany Brittany to the dance—except, as Jodie points out to Brittany, Robert, who has been on vacation with his family while this crisis developed. Overwhelmed and sans clue as to how to organize the dance, Quinn gets aid from an unexpected source: Jane Lane, who at the beginning of the episode was lamenting the lack of a "medium grand enough to do justice to my inner torment," takes over the logistics and (more important) decorations from Quinn, and turns the gymnasium into a gigantic pastiche of Jackson Pollock-like drip paintings—and a representational (and gory) depiction of the car crash that killed him. Sandi's party turns out to be a complete bust, and the bored guys bail out while the Fashion Club is changing into swimsuits for some hot-tubbing. At the school, the dance is in full swing, with Upchuck as the D.J. (to keep him off the dance floor), and Jane's decorations are a huge hit. Quinn is mortified by the decor, but then takes full credit for it when her two dates start complimenting her on it and she realizes that the night is a success. Daria and Jane sit on the sidelines to watch the proceedings, and soon begin chatting it up with two guys, Brett and Brad, whose attitudes and outlook on life seem to be very similar to theirs. However, they back off when they find out that the guys are Upchuck's cousins, and thus are "carriers of the dreaded Ruttheimer gene". 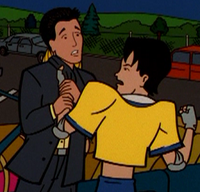 Out in the parking lot, Brittany's date Robert gets into a fight with a jealous Kevin, and Joey, Jeffy and Jamie start fighting with Quinn's dates. In the end, Kevin and Brittany make up (while Kevin is being hauled away in an ambulance) and Daria and Jane figure that the whole evening was a wash... until it starts to snow, and they notice that the swimsuit-clad Fashion Club has been locked out of the house by Sandi's brothers. We're in the big time! During art class, Jane paints a reproduction of Francisco Goya's The Third of May 1808. Sandi's flashback shows her old school was called "Gle_field Middle School" (possibly Glenfield). Brad and Brett, Upchuck's cousins, make their only appearance in the series in this episode. 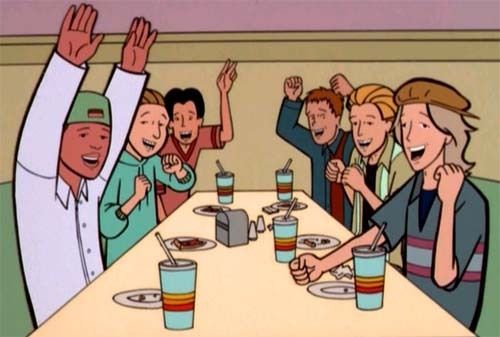 The Three Js are hanging out with three unnamed "backgrounders", a rare moment of them with other friends who aren't in the Lawndale Lions. All the backgrounder characters at the party are wearing fancy clothes for once - which they'll wear again in "Just Add Water". "It's Like the Beginning of an Era" by Kristen Bealer, which can be found here, expands on the flashback and details Sandi's attempts to organize a middle school dance. In the Dariarotica comic "Brushed off" by Wouter, when Jane is working on her "Tools of the trade" exhibition she likens the amount of work she's putting into to the work she put in decorating the Gym in "Daria Dance Party"
This page was last edited on 23 April 2018, at 21:30.